Prove the effectiveness of every piece of content you distribute with Send Social Media Analytics dashboard which helps to track just about everything including clicks, referrers, shares, comments, views and more. When you begin engaging on social media, you’ll want to know which types of content work best. This will give you an optimal direction for your future efforts. As a social media analytics dashboard, we make this just as easy as being active. Our tool provides all the insights needed to easily understand what’s creating the most momentum for your business on social media. Build and schedule reports that can be automatically delivered to you or your clients via email on a specific day or time. The raw data can also be exported via CVS for custom reporting. Select one of Send Social Media’s integrated URL shorteners including bit.ly, goo.gl and is.gd and Send Social Media will automatically track your click statistics. Even use your own vanity URL with bit.ly pro. 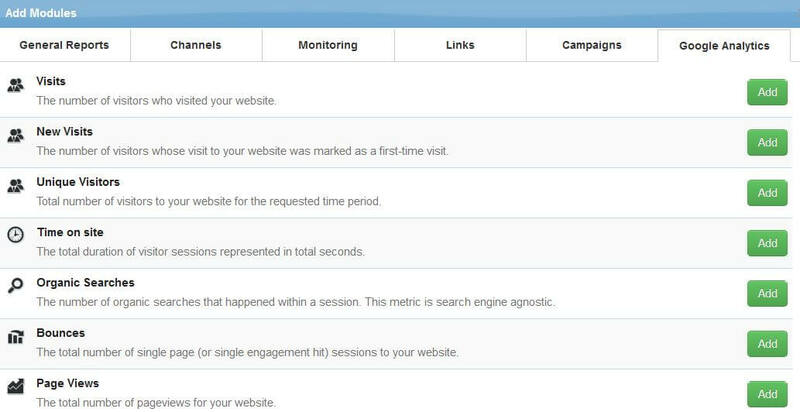 Gauge the effect your email & social media campaigns are having on traffic to your website with social media analytics feature such as Google Analytics, integrated directly into Send Social Media. This social media analytics dashboard tracks your social networks accounts and reports on various metrics including fans/followers over time, engagement, klout, sentiment and more.